One of my grandmothers had a strong affection for light blues and soft aquas. The other one loved pink. She even had pink carpet throughout her house for the longest time. Between the two of them, they nurtured my creativity from a very young age. When I would go visit them they would both let me sew pieces of scrap fabric, color and draw until my heart was content, and dig through the assorted treasures that they had collected over the years. One of my latest graphics sets – The Sugar Baby Collection – is reminiscent of my love for each of my grandmothers. This collection is full of pastel hues, charming textures, and overall simplistic vintage whimsy. My darling Nana in her cowboy hat. When I was creating the graphics, I found myself thinking back to the slow southern days of being a little girl in each of their houses. It would be so amazing to spend just one day with each of them – watching them sew and cook, and listening to them talk. I would love to tell them about my business. And how much their influences can be found within it. I like to think they already know all about it. I am so grateful for the love and all they taught me. Introducing The Sugar Baby Collection. 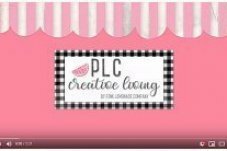 This collection can be found inside PLC Creative Living.